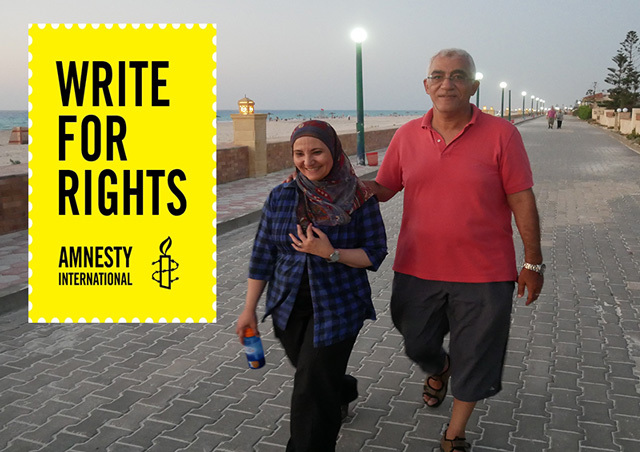 Please use this template to email Egyptian authorities to appeal for Ola and Hosam’s freedom. Ola Al-Qaradawi (55) and Hosam El-Din Khalaf (58) have been illegally and arbitrarily detained in Egypt since June 30, 2017. Egyptian authorities did not present an arrest or search warrant, and no explanation was given for their arrest. To this day, there are no formal charges filed against Ola and Hosam. Ola and Hosam have been detained in separate prisons pursuant to renewable 15-day temporary orders. The specific conditions of their detention are unknown, as visits from family or legal counsel are prohibited. However, according to the statements issued by Amnesty International and Human Rights Watch we know that they are held in solitary confinement for 24 hours a day, and are being denied necessary medical care. Ola is suffering from especially poor sanitary conditions and malnourishment, which are causing her health to deteriorate rapidly. The case of Ola and Hosam is extremely alarming. I urge you to assist with Ola and Hosam’s immediate release. I urge you to immediately end the solitary confinement of Ola and Hosam ensuring that they are held in humane conditions and receive adequate healthcare. Also, I urge you to allow Ola and Hosam access to their families and lawyers.